How to Download Music from Computer to iPhone 8/7/X? For all users with the same problem as Penny does, here's an easy way out – DearMob's iPhone Music Manager offers a free solution to download music from computer to iPhone in such formats as MP3, AAC, MP3, ALAC etc. There's no need to stand with the tedious process with iTunes for Windows, learn how you can download music from computer to iPhone as easy as ABC. Free Download Music from Computer to iPhone Tier-One Choice! Let's assume you've successfully installed the iPhone music manager software on either computer (Windows 10 included) or Mac (macOS Mojave included), launch it before you connect the iPhone to computer with an original Apple's USB cable. Step 1: First unlock iPhone, tap on "trust this computer" to help it recognize the Windows system before you can download music from computer to iPhone in MP3 AAC FLAC. Step 2: Click on the second tab "Add Music" from the main panel, you may select: A folder/A single song/Several songs in random to download music from computer to iPhone, be it in MP3 AAC FLAC, etc. 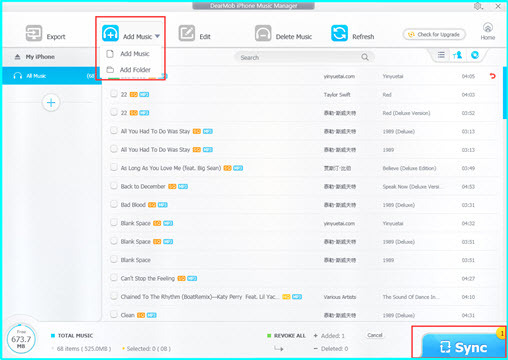 This step is revocable – click on the small "cancel" icon enables you to re-select the songs to be imported before the software download music to iPhone. Step 3: Click on "Sync" at the bottom-right corner of the free music manager to automatically download songs, albums to iPhone 8. Although this process is revocable, you may delete songs from iPhone easily later. Step 1: Hover your mouse over a song imported from computer to DearMob iPhone Music Manager, click on the "make ringtone" icon to initiate the time-span selection panel. Step 2: Customize the starting point and ending point within the panel, then click on "OK" to return to the main music sync panel. Step 3: Click on "Sync" to set the DIY ringtone for your iPhone after you download music from computer to iPhone. 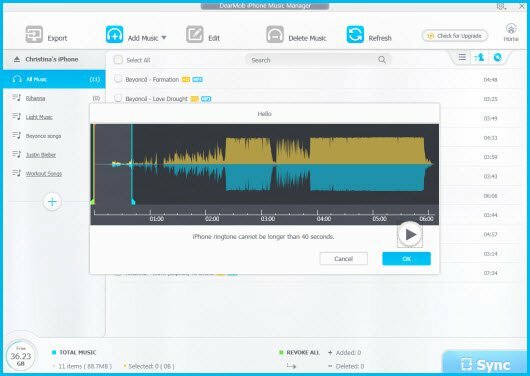 Tips and Notes: You can also use this tool to backward transfer music from iPhone to computer. Unlike some affiliate iPhone Music Transfer software, which relies on iTunes module to download music from computer to iPhone, iPad, this iPhone Music Manager can work independent of iTunes, thus saving the space for your hard drive. You may create several ringtones for iPhone from computer at a time. If this software is the very one you're looking for, click to free download it below. Subscribers of Apple Music, iTunes Match can only sync tracks purchased from Apple Store, which means you can only download music from computer to iPhone 8 and merge them with Apple Music, but you won't be able to backward transfer music from iPhone to computer. Step 1: Upgrade iTunes to the latest version, cable-connect iPhone and computer, import music from computer to iTunes library before you can download music from computer to iPhone. Tips: An iPhone only recognize the first iTunes Library that it is connected to. Step 3: Check the music titles that you want to download to iPhone from computer. Step 4: Right click on the song titles > Add to device > My iPhone. By default, one iPhone device only recognize an iTunes Library, which means taking songs from a friend's music collection would involve much more effort than you do with the iPhone Manager software. You may stick with iTunes anyhow. But looking back for DearMob iPhone Manager would quicken up your downloading. For upgraded utilities to download music to iPhone from computer, DearMob iPhone Manager is a second-to-none choice if you'd like to download music from computer to iPhone, the software which offers all-round capable service – to remove DRM-protection for some AAC music purchased in iTunes Store. The speed that DearMob iPhone Manager download music from computer to iPhone is indeed stunning, a 2 minute transfer can cover over 300 songs. On top of that, this music downloader can transfer iTunes music and turn it into DRM-free MP3. So take a look at how you can proceed to download music from computer to iPhone with this video guide. Step 1: First download the best iPhone music manager, install and launch it. << Refer to the video guide for step-by-step instructions. Step 2: USB connect iPhone to computer, unlock and trust it with the PC. Step 3: Amongst the 7 tabs: Photo Transfer, Music Manager, Video Manager, Book, Voice & Ringtone, Flash Drive, visit Music Manager. Step 4: Click on "Add Music" as you do with DearMob iPhone Music Manager, drag the music you want to transfer and add them into a selected playlist. Step 5: Click on "Sync" to download music from computer to iPhone 8. DearMob iPhone Music Manager: Free, fast, robust music transfer function only. iTunes Music Library: Slow, all-inclusive, not compatible for Apple Music subscribers. DearMob iPhone Manager: Premium, fast, supportive of 7 types to file transfer including music. If what you're looking for is a free and fast solution to download music from computer to iPhone, then without doubt you're good to go with DearMob iPhone Manager. If you're also considering about acquiring more free music online, how to download YouTube to AAC may help you there. 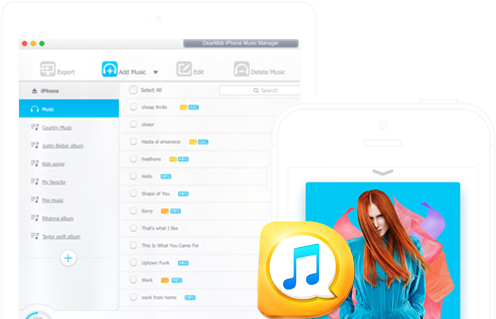 DearMob iPhone Music Manager offers you the feasibility to manage music on iPhone freely. One-click transfer any music song to Mac/PC for backup, edit the music info, batch-delete songs, etc. How do I transfer music from laptop to iPhone without iTunes free? How do I put mp3 files on my new iPhone? 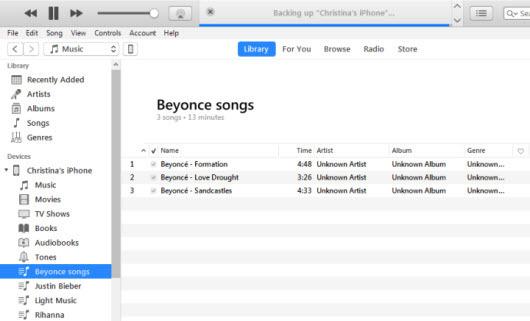 Click to view our step-by-step guide on how to free copy songs from PC to iPhone no iTunes, no hassel.